MODEL NCH8a - MOST POPULAR! Shown in a wider arm stance than the original, this one is in antique brass. 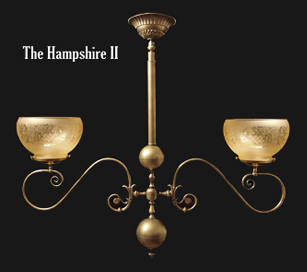 The 'Hampshire' line of fixtures is one of our most spopular. This one is shown with amber bowl, acid etched French globe shades.